Deep linking is a way to open a specific view (or page) within a mobile app using a link. This technique is similar to the way an http hyperlink allows you to open a specific page on a website (e.g., “http://example.com/path/page”). You can click a deep link from inside an email, a website or even another mobile app. Using deep links can make two mobile apps work together seamlessly. What is the ID123 App deep link URI? What is “iid” and “ctid”? Where to find “iid” and “ctid”? “iid” (Institution ID) is located under ‘Brand Info’ of Account Settings on IDMS. “ctid” (Card template ID) is located under ‘General Settings’ of the Card Template Builder on IDMS. Note: “IDMS” is short for ID Management System, which is the administrative web portal for account administrators where they issue and manage digital ID cards. What deep link views are supported? Search Institution Results View Launches the Search Institution Results View. Optionally pass search parameters to automatically filter the search when viewing the app page. Selected Institution View Launches the Selected Institution View with a specific institution selected. If the institution has only one card available, it will redirect the user to the Create Card View. If the institution has more than one card, the user will be asked to select a card offered by the institution. Launches the Create Card View for a specific institution. If the template is Self-Issued, the user will need to fill out card details to create a card. If the template is Institution Issued – Self Provisioned, the user will only need to answer security questions to generate their card. Launches the Card View of an existing card. If the card does not exist, it defaults to the dashboard screen. 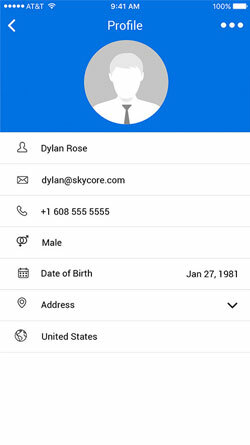 This deep link will direct users to the My Identity View when the user is logged into the mobile app. How to generate this link? Insert your zip code in place of ‘12345’ into the deep link after ‘zip=’. Insert your radius in place of ’20’ into the deep link after ‘radius=’. Insert your search name in place of ‘institution’ into the deep link after ‘search-name=’. This deep link will direct users to the Search Institution Results page for specific search queries. The deep link can contain a zip code and radius, as well as a search name. The radius is should be under 50 miles. Log into your account on IDMS, click on ‘Brand Info’, copy your Institution ID, and paste it into the deep link after “iid=” in place of ‘1b52a69bfa13537e4886a3f057f50f767be9ac1d’. This deep link will display the Selected Institution View in the app. If there are multiple cards offered by the institution, then they will be prompted to select a card. If there is only one card available for the institution, then the user will be automatically forwarded to create the card. If they are not logged in, the next step will be registration. 1. Log into your account on IDMS, click on ‘Brand Info’, copy the Institution ID, and paste it into the deep link after “iid=” in place of ‘1b52a69bfa13537e4886a3f057f50f767be9ac1d’. 2. Log into your account on IDMS, click on ‘Digital Cards’, click on ‘Edit’ of the card template you want to use, copy the Card Template ID, and paste it into the deep link after “ctid=” in place of ‘12345fsdadasd’. This deep link will bring the user to the Create Card View for a specific card. If the template is Self-Issued, the user will need to fill out card details to create a card. If the template is Institution Issued – Self Provisioned, the user will only need to answer security questions to generate their card. This will only happen if the user is logged in, otherwise they will be redirected to the Register/Login page. Log into your account on IDMS, click on ‘Digital Cards’, click on ‘Edit’ of the card template you want to use, copy the Card Template ID, and paste it into the deep link after ‘ctid=’ in place of ‘12345fsdadasd’. This deep link will launch a previously installed ID card. This will only happen if the user is logged in, otherwise they will be redirected to the Register/Login page.